My style in art, fashion, and everything that I love so much. Here are some of my drawings of the Legendary Prince that I thought I post showing that I will always remember him. Everywhere on TV. all this week everyone was talking about the Beloved Prince so I thought I show my love of how much I miss him and I’m sure his other fans miss him as well. He will always be loved and truly missed. He was a beautiful talented musician and person and I believe his music and of course his spirit will always be around and never forgotten. We love you Prince. I’m a Suicide Squad fan so I did a drawing of my two favorite characters in the movie and I tried my best but here it is below. This is a mixed media piece of Natalie Portman with a splash of paint over my drawing of her. Just click on the link below to go directly to my Art Piece of Natalie Portman. 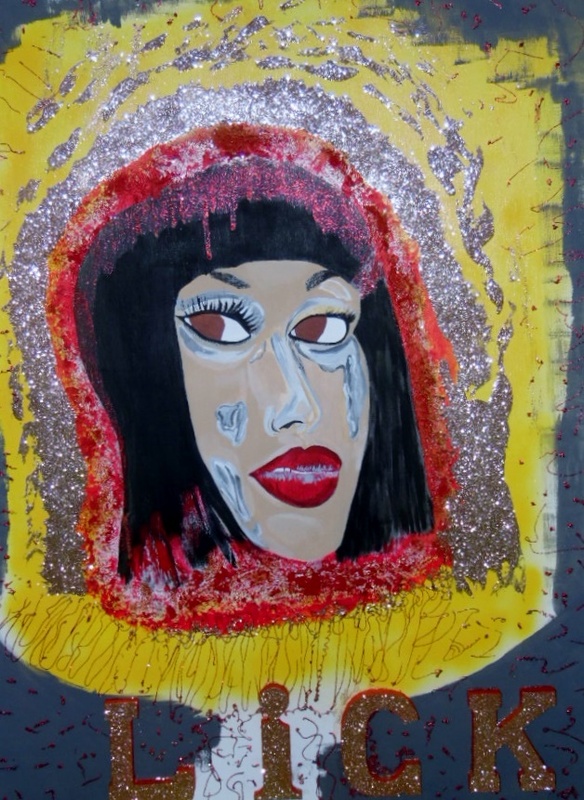 I’m Selling my Original Art of Two Sparkling Females on sale for $60 and it’s on a white 12 in x 12 in Canvas, and on one of the females face is a mix of Swarovski crystals and rhinestones, and it’s a drawing and painting of two females sparkling with paint and some glitter and around one of the females are pink glittered cloth pins but it is a very lovely piece but I put a lot of work into it and remember I always do freelance work and take commission orders all the time if anyone is interested in having something special done. And I accept payments through pay pal and I ship my art for free so there’s free shipping on my original art only not through my pixels or faa site. So if anyone interested in buying this send me a message through my http://nicole-burrell.pixels.com website and I will email my email address in a response back to you and we will go from there. And the Art work is listed above.